The achievements of ancient civilizations can be stunning. Tourists around the world flock to see the ruins of countless cultures most of whom no longer exist. Even though many of these places have been an abandoned for centuries they still inspire awe and admiration from people around the globe. This is a list of some of the best pre-industrial ruins around the globe. Some of them are considered a UNESCO World Heritage Site others are not but they are all amazing. Leptis Magna was one of the most prominent cities of the Roman Empire. The ruins are located in Al Khums, 130 kilometres from Tripoli, Libya, directly along the coastline of the Mediterranean Sea. The site is one of the most spectacular and unspoiled Roman ruins in the Mediterranean. It was founded around 1100 BC by the Phoenicians, but became much more important from the 5th century BC onwards, when Carthage became a major power in the Mediterranean region. The Archaeological Site of Leptis Magna, as it's officially called, was inscribed on the Unesco World Heritage List in 1982. Admission: General Admission: LE 50, Entrance to the Interior of Pyramids: LE 30 to LE 100, The Great Pyramid: LE 100 and limited to only two batches daily of 150 tickets – one sold at 8:00am the other 1:00pm. Forget about the new 7 Wonders of the Ancient world, this is the only remaining ruin on the original 7 Wonders of the Ancient World list. The Pyramids of Giza have been enticing international travellers for over two thousand years since Alexander the Great's army told the Greek world about them. The Pharaohs of the old Kingdom knew how to build a monument to their death. Unfortunately these large pyramids were magnets for tomb robbers who most likely looted them thousands of years ago. Due to the popularity of the Great Pyramid it is best to show up early to buy a ticket and since most tour groups go in the morning it is slightly easier to get a ticket for the afternoon visit at 1:00pm. Today the pyramids continue to be one of the popular tourist spots in the world and still live up to the claim to fame of Alexander the Great. Angkor is one of the most stunning places in the world. This ancient city was huge! This city is made of thousands of ruins some just little temples or public structures others massive temples that many countries would kill just to have one. 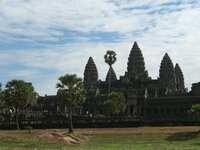 At the centre of the city is the most impressive temple in the whole world; the Angkor Wat. Angkor Wat is the largest religious structure in the world and its multiple floors and dark passages ways covered in carvings can be stunning. At the top is a very small shrine with incenses burning at all times. The city was abandoned after the Thai sacked the city in the 15th century. It was rediscovered in 1860 by a French explorer although local villagers still tended to some of the more important shrines. Although it can't be seen from space, the Great Wall of China is still one of the most impressive sights in the world. The Great Wall stretches more than 6,400 kilometres and at its height during the Ming Dynasty had more than a million soldiers posted on it. The wall was originally built to keep invaders from the north out of China. With the start of the Qing dynasty, when invaders from the north took over China, the wall was slowly abandoned and left alone. There is something for everyone to do at the different sections of the Great Wall, ranging from zip lines to stunning remote hikes. Even Chairman Mao said "that a man wasn't a man until he saw the Great Wall." Admission: Rp95,000 (US$11), there are also more expensive sunrise and sunset tickets. The Borobudur Temple Compounds is a giant Buddhist temple complex, built in the 8th and 9th century. The building has nine so-called stupas. The first 5 make up the pyramidical base of the structure, on top of that are 3 circular stupas and finally there is one big stupa on top of all the others. Around the 3 circular stupas are 72 open stupas with statues of Buddha inside. In the 10th of 11th century the temple was abandoned, and only rediscovered at the end of the 19th, after which the structure was cleared from the vegetation, and finally at the end of the 20th century it was restored with the help of the UNESCO. Near to the Borobudur is the Hindi Prambanan Temple, which is also on the UNESCO World Heritage list. The ancient Mayan site of Copan was discovered in 1570 by Diego García de Palacio and nowadays functions as one of the most important sites of the Mayan civilization. However, the ruins were not excavated until the 19th century. This city was the center of the Xukpi kingdom, translated to the Corner Bundle. At its height the city was home to a large class of minro nobility, scribes and artisans that were wealthy enough to have stone homes, which in most Mayan cities only kings could afford. Many of these stone homes are covered in hieroglyphic texts that give a glimpse into the everyday lives of Mayans. The ruined citadel and imposing public squares reveal the three main stages of development before the city was abandoned in the early 10th century. As a result of its historical significance it is placed on the UNESCO World Heritage List. Tikal is considered the most impressive ancient Mayan city. The location was first settled in the 4th century BC and slowly grew in power over the centuries. At its height, Tikal was the centre of the Mayan world and had over two hundred thousand citizens. 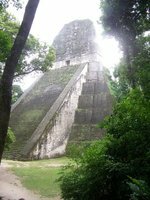 Other than a brief period when it was conquered by a neighbouring city-state, Tikal was the primary influence over Mayan culture and thought. One amazing feature of this ancient city is there is no direct water source; water was collected by using sink holes. The city sprawls over a large area and is very remote so bring plenty of food with you. Only a small fraction has been excavated and many of the pyramids are still covered in dense jungle. Getting here is difficult but well worth it. Admission: Adults €9 + €2 (for Exhibitions), Free for EU residents under 18 or over 65 years. “Fight’em to the death” is what the Colosseum screams to most modern day people but the structure was much more than the ancient world death match arena. Many cities in the Roman Empire had stunning amphitheatres including Pompeii. When construction was completed in 80 AD the Colosseum was the pinnacle of engineering and technology of the Roman Empire. When it was built this amphitheatre could house over fifty thousand blood thirsty spectators and it was the largest amphitheatre in all of Rome. Its concrete and stone walls could be flooded to create mock sea battles where little ships would battle it out. Other games included battle re-enactments, beast on beast combat and of course the famous gladiator combats. Today the Colosseum and the nearby Roman Forum are major tourist sites and must-sees when visiting Rome. Probably one of the most recognized sites in the world, Stonehenge has mesmerized people for thousands of years. Although its height of influence and activity first took place at the site over 5,000 years ago, and some archaeologists even think maybe even further back in time, it did not look as impressive as it looks today. These massive stones were brought from over 380 kilometres (240 miles) away in neighbouring Wales. It grew organically with the centuries and has become one of the most famous megalithic architecture sites in the world. There are megalithic sites scattered all over Europe and Stonehenge is by far the most visited and well known. Admission: One Day JD21, Two Day JD26, Four Day JD31, Children under 10 are half price, Jordanians and Residents of Jordan can enter for JD1. Every seen Indiana Jones and the Last Crusade? The part at the end of the movie when Harrison Ford walks into that amazing building built into a cliff? That is the entrance to Petra. Petra was a major trading centre in the Middle East for over 300 years and stunning architecture is mind blowing. It grew over the centuries gaining influence from the neighbouring powers of Syria, Greece, Egypt and Rome. 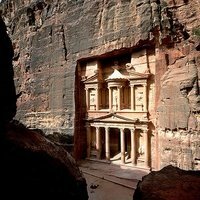 After being acquired by Rome in 106 AD Petra had a quick up shot of power and wealth in the next century then a rapid decline. The decline can be attributed to the movement of trade routes to the sea and earthquake in the mid 4th century. Chichen Itza is one of the new 7 world wonders and for good reason. The site is located on the Yucatán Peninsula between Mérida and Valladolid. The site is very popular for day trips from tourists who stay in the Riviera Maya. The main attraction is the big pyramid of Kukulcan or El Castillo. Unfortunately it is not possibly to climb up the pyramid anymore but it is also impressive to see the building and to imagine how the Mayans have constructed it. They must have had quite some knowledge of mathematics and astrology. The ground plan of the pyramid has square terraces with stairways on every side to the temple on the top. Two times a year during the Spring and Autumn equinox it seems like a snake comes down the stairs of the north staircase. This symbolises the feathered snake which represents Kukulcan or Quetzalcoatle. The shadow moves down by the movement of the sun during the rising and setting of the sun. Underneath the temple archeologists have found another temple. Inside the temple was a Chac Mool statue and a throne in the shape of a jaguar, painted red with spots made of inlaid jade. As most other archeological sites Chichen Itza also has a ball field but it is bigger than many others. Although nobody knows exactly how the ballgame was played the pictures on the walls suggest that the game ended quite bloody. Mesa Verde National Park is home to the stunning Cliff Palace and many other famous alcove city ruins. Mesa Verde is a large mesa that is home to thousands of Ancestral Pueblo sites from Late Basket Maker to Pueblo III spanning several hundred years of development. The Four Corners (border area Arizona, Colorado, New Mexico, Utah) area was inhabitant by sedentary farming people from about 750 AD to 1300 AD when all the people in the settlements relocated, for unknown reasons, south to New Mexico and Arizona. They left behind stunning cities, rock art and pottery all over the region. Even to this day people wonder why they left this area that they had lived in for more than a thousand years. 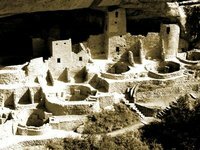 Although it is hard to get to Mesa Verde, it is one of the most amazing sites in the world and well worth the difficult trek. If you are further interested in Ancestral Pueblo sites you should plan a trip to Choco Canyon National Historical Park, which is also an amazing place but even harder to get to than Mesa Verde and has no hotels. The Palenque Ruins are the main reason why people come to Palenque. Although not as massive as Tikal, its rival to the south, Palenque is home to some stunning structures and well preserved wall art that few other major Mayan sites can claim to have. Remember that during the busy season Palenque can have over a 1,000 visitors a day, so it can get awfully crowded. Although it is possible to take tours to the ruins most of the time the tours do not stay long enough. This is practically true for day tours from San Cristobal de las Casas, which only give 2 hours at the ruins. In order to really experience the awe, wonder and every corner of this ancient city it takes 4 to 6 hours. It is best to bring good walking shoes and plenty of water. As a warning the mushrooms sold by locals near the entrance in the spring time are of the magic variety. When people think of Micronesia they think surf, sand, sun and relaxing. The idea of an ancient city built in the water of large rocks that the elite lived in to control the commoners does not enter the mind. Nan Madol is an ancient city that is called the Venice of Pacific. The name Nan Madol itself means "the spaces in between" talking about the canals. The elite rulers lived in the city and the common folk brought all their needs to them including fine food and water. It is believed that only around a thousand people actually lived in the city. No one knows exactly when Nan Madol was abandoned but it was completely empty by the time the Europeans arrived during the 19th century. 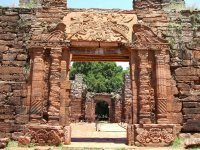 The ruins of São Miguel das Missões in Brazil, and those of San Ignacio Miní, Santa Ana, Nuestra Señora de Loreto and Santa María la Mayor in Argentina, are the impressive remains of five Jesuit missions, built in the land of the Guaranis during the 17th and 18th centuries. Each is characterized by a specific layout and a different state of conservation and together they form one UNESCO World Heritage Site. In addition there are Jesuit Missions in Paraguay: the Jesuit Missions of La Santísima Trinidad de Paraná and Jesús de Tavarangue. These missions are a reminder of the Jesuits' Christianization of the Río de la Plata basin in the 17th and 18th centuries, with the accompanying social and economic initiatives and are also on the UNESCO World Heritage List. Known as the lost city of the Incas, Machu Picchu is one of the most stunning places on earth. Lost to the world till 1911, it was spared the savage plundering and destruction that the Spanish brought to other Incan cities. No one knows why the city was built, where it was, or what it was meant for. Due to the quick destruction of the Inca Empire the city was left alone for hundreds of years. It is quite evident from recent digs that they believe that Machu Picchu was an important city and large trading centre. It was only found because locals showed it to Hiram Bingham. In the past it was very easy to arrange a hike to Machu Picchu but due to overuse the government has wisely limited the number of hikers. If planning to hike the Inca trail during a busy time of the year it is best to arrange things as far as a year in advance. Getting There: Expensive flight from mainland Chile. Easter Island boasts the infamous statues called Moai. Built by the native Rapanui people, these elongated faces haunt and confuse people around the world. No one knows exactly when they were built, but it is known that after their construction, the civilization entered into a time of massive famine. From the 18th century to the mid-19th century, Easter Island went through a period where most of the statues were purposely knocked over or ignored. Also, the native Rapanui suffered from European exploitation and illness towards the end of this time, killing most of them off or forcing them to relocate. Therefore little information is known about how the culture of the Rapanui worked except from missionaries and a few European explorers. What can be figured out is that the Rapanui people had a very complex civilization that had many boom and bust cycles. The Rapa Nui National Park, which protects the Moai, was inscribed on the Unesco World Heritage List in 1995. 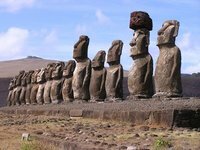 Easter Island is about 4 or 5 hours from Santiago de Chile, Chile and flights start at US$600-700, so a visit doesn't come cheap. This is version 50. Last edited at 11:12 on May 29, 17 by Utrecht. 13 articles link to this page.